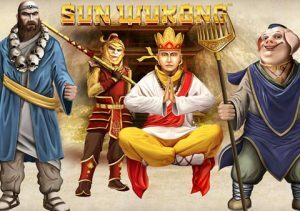 A monkey born from stone who goes on to gain magical powers is the unlikely back story to Sun Wukong, a Chinese legend themed video slot from Playtech. It’s a 5 reel, 15 payline game that comes with a bonus feature that awards up to 100 free spins with multipliers ranging from between 2x and 5x. Play from between 15p and £1,125 per spin. Visually Sun Wukong is fairly basic fare – set against a mountain backdrop and encased within a traditional Chinese temple style building, the reels include A to 9 playing cards as well as fruit, wild horses and a collection of characters from the original folk tale. The Monkey King is the game’s wild, substituting for all other symbols apart from the scatter. Whenever the Monkey King forms part of a winning combination, that payout is doubled. 5 wilds in a row pays 10,000 coins. Opt for the Valley of the Sun and you’ll be awarded 20 free spins with all payouts boosted by a 2x multiplier and doubled. Choose the Mountain of Fruit and Flowers and it’s 10 free spins with all payouts boosted by a 4x multiplier and quadrupled. The third option is the Kingdom of Heaven which awards just 8 free spins. Those free spins receive a potentially very lucrative 5x multiplier though. Whichever 1 you choose, you can re-trigger more free spins by landing 2 or more scatters during the feature. 5 will give you a whopping 100 extra free spins! This video slot will ring a bell with players of a certain age who remember the cult Japanese TV show Monkey which was based on the tale of Sun Wukong. This slot version isn’t quite as bonkers as the television adaptation but remains entertaining in its own right. The visuals may look a little dated but the double wild wins and free spins with multipliers make this a playable game that can still provide some memorable results.